Definition at line 21 of file ARMInstPrinter.h. Definition at line 71 of file ARMInstPrinter.cpp. true if the option is recognized and applied. Definition at line 75 of file ARMInstPrinter.cpp. 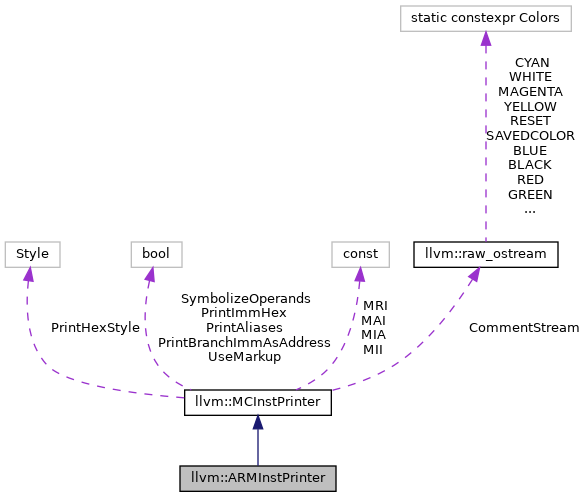 Referenced by llvm::ARMAsmPrinter::PrintAsmMemoryOperand(), llvm::ARMAsmPrinter::PrintAsmOperand(), llvm::ARMAsmPrinter::printOperand(), and printRegName(). Definition at line 489 of file ARMInstPrinter.cpp. References llvm::ARM_AM::getAddrOpcStr(), llvm::ARM_AM::getAM2Offset(), llvm::ARM_AM::getAM2Op(), llvm::ARM_AM::getAM2ShiftOpc(), llvm::MCOperand::getImm(), llvm::MCInst::getOperand(), llvm::MCOperand::getReg(), llvm::MCInstPrinter::markup(), printRegImmShift(), printRegName(), and llvm::MCInstPrinter::UseMarkup. Definition at line 470 of file ARMInstPrinter.cpp. References assert(), llvm::ARM_AM::getAM2IdxMode(), llvm::MCOperand::getImm(), llvm::MCInst::getOperand(), llvm::ARMII::IndexModePost, llvm::MCOperand::isReg(), printAM2PreOrOffsetIndexOp(), and printOperand(). Definition at line 559 of file ARMInstPrinter.cpp. References llvm::ARM_AM::getAddrOpcStr(), llvm::ARM_AM::getAM3Offset(), llvm::ARM_AM::getAM3Op(), llvm::MCOperand::getImm(), llvm::MCInst::getOperand(), llvm::MCOperand::getReg(), llvm::MCInstPrinter::markup(), and printRegName(). Definition at line 544 of file ARMInstPrinter.cpp. References assert(), llvm::ARM_AM::getAM3IdxMode(), llvm::MCOperand::getImm(), llvm::MCInst::getOperand(), llvm::ARMII::IndexModePost, llvm::MCOperand::isReg(), printAM3PreOrOffsetIndexOp(), and printOperand(). Definition at line 639 of file ARMInstPrinter.cpp. References llvm::ARM_AM::getAddrOpcStr(), llvm::ARM_AM::getAM5FP16Offset(), llvm::ARM_AM::getAM5FP16Op(), llvm::MCOperand::getImm(), llvm::MCInst::getOperand(), llvm::MCOperand::getReg(), llvm::MCOperand::isReg(), llvm::MCInstPrinter::markup(), printOperand(), printRegName(), and llvm::ARM_AM::sub. Definition at line 615 of file ARMInstPrinter.cpp. References llvm::ARM_AM::getAddrOpcStr(), llvm::ARM_AM::getAM5Offset(), llvm::ARM_AM::getAM5Op(), llvm::MCOperand::getImm(), llvm::MCInst::getOperand(), llvm::MCOperand::getReg(), llvm::MCOperand::isReg(), llvm::MCInstPrinter::markup(), printOperand(), printRegName(), and llvm::ARM_AM::sub. Definition at line 689 of file ARMInstPrinter.cpp. References llvm::MCInst::getOperand(), llvm::MCOperand::getReg(), and printRegName(). Definition at line 666 of file ARMInstPrinter.cpp. References llvm::MCOperand::getImm(), llvm::MCInst::getOperand(), llvm::MCOperand::getReg(), llvm::MCInstPrinter::markup(), and printRegName(). Definition at line 680 of file ARMInstPrinter.cpp. References llvm::MCInst::getOperand(), llvm::MCOperand::getReg(), llvm::MCInstPrinter::markup(), and printRegName(). Definition at line 1125 of file ARMInstPrinter.cpp. References llvm::MCInstPrinter::formatImm(), llvm::MCOperand::getImm(), llvm::MCInst::getOperand(), llvm::MCOperand::getReg(), llvm::MCOperand::isReg(), llvm::MCInstPrinter::markup(), printOperand(), and printRegName(). Definition at line 446 of file ARMInstPrinter.cpp. Definition at line 458 of file ARMInstPrinter.cpp. Definition at line 981 of file ARMInstPrinter.cpp. References llvm::MCOperand::getExpr(), llvm::MCOperand::getImm(), llvm::MCInst::getOperand(), llvm::MCOperand::isExpr(), llvm::MCInstPrinter::MAI, llvm::MCInstPrinter::markup(), llvm::MCExpr::print(), and scale(). Definition at line 417 of file ARMInstPrinter.cpp. Definition at line 515 of file ARMInstPrinter.cpp. References llvm::ARM_AM::getAddrOpcStr(), llvm::ARM_AM::getAM3Offset(), llvm::ARM_AM::getAM3Op(), llvm::MCOperand::getImm(), llvm::MCInst::getOperand(), llvm::MCOperand::getReg(), llvm::MCInstPrinter::markup(), op, printRegName(), and llvm::ARM_AM::sub. Definition at line 908 of file ARMInstPrinter.cpp. References assert(), llvm::MCOperand::getImm(), llvm::MCInst::getOperand(), and Name. Definition at line 702 of file ARMInstPrinter.cpp. References assert(), llvm::countLeadingZeros(), llvm::countTrailingZeros(), llvm::MCOperand::getImm(), llvm::MCInst::getOperand(), llvm::MCOperand::isImm(), and llvm::MCInstPrinter::markup(). Definition at line 963 of file ARMInstPrinter.cpp. Definition at line 1576 of file ARMInstPrinter.cpp. Definition at line 969 of file ARMInstPrinter.cpp. Definition at line 814 of file ARMInstPrinter.cpp. References llvm::MCOperand::getImm(), llvm::MCInst::getOperand(), and llvm::ARM_PROC::IFlagsToString(). Definition at line 808 of file ARMInstPrinter.cpp. References llvm::MCOperand::getImm(), llvm::MCInst::getOperand(), and llvm::ARM_PROC::IModToString(). Definition at line 1356 of file ARMInstPrinter.cpp. References llvm::MCOperand::getImm(), llvm::MCInst::getOperand(), and llvm::MCInstPrinter::markup(). Definition at line 1362 of file ARMInstPrinter.cpp. Definition at line 1279 of file ARMInstPrinter.cpp. References llvm::ARM_AM::getFPImmFloat(), llvm::MCOperand::getImm(), llvm::MCInst::getOperand(), and llvm::MCInstPrinter::markup(). Definition at line 789 of file ARMInstPrinter.cpp. References llvm::MCInst::getOperand(), llvm::MCOperand::getReg(), llvm::MCRegisterInfo::getSubReg(), llvm::MCInstPrinter::MRI, printRegName(), and Reg. Definition at line 1298 of file ARMInstPrinter.cpp. References llvm::MCInstPrinter::formatImm(), llvm::MCOperand::getImm(), llvm::MCInst::getOperand(), and llvm::MCInstPrinter::markup(). Definition at line 91 of file ARMInstPrinter.cpp. References llvm::MCInst::addOperand(), assert(), llvm::MCRegisterClass::contains(), llvm::MCOperand::createReg(), llvm::MCOperand::getImm(), llvm::MCRegisterInfo::getMatchingSuperReg(), llvm::MCInst::getNumOperands(), llvm::MCInst::getOpcode(), llvm::MCInst::getOperand(), llvm::MCOperand::getReg(), llvm::MCRegisterInfo::getRegClass(), llvm::ARM_AM::getShiftOpcStr(), llvm::ARM_AM::getSORegOffset(), llvm::ARM_AM::getSORegShOp(), isStore(), llvm::MCInstPrinter::markup(), llvm::MCInstPrinter::MRI, printAliasInstr(), llvm::MCInstPrinter::printAnnotation(), printInstruction(), printPredicateOperand(), printRegisterList(), printRegName(), printSBitModifierOperand(), Reg, llvm::ARM_AM::rrx, llvm::MCInst::setOpcode(), and translateShiftImm(). Definition at line 722 of file ARMInstPrinter.cpp. References llvm::MCOperand::getImm(), llvm::MCInst::getOperand(), and llvm::ARM_ISB::InstSyncBOptToString(). Definition at line 606 of file ARMInstPrinter.cpp. References llvm::ARM_AM::getAM4SubMode(), llvm::ARM_AM::getAMSubModeStr(), llvm::MCOperand::getImm(), llvm::MCInst::getOperand(), and Mode. Definition at line 933 of file ARMInstPrinter.cpp. References llvm::ARMCondCodeToString(), llvm::MCOperand::getImm(), and llvm::MCInst::getOperand(). Definition at line 715 of file ARMInstPrinter.cpp. References llvm::MCSubtargetInfo::getFeatureBits(), llvm::MCOperand::getImm(), llvm::MCInst::getOperand(), and llvm::ARM_MB::MemBOptToString(). Definition at line 1315 of file ARMInstPrinter.cpp. References llvm::tgtok::Bits, llvm::MCOperand::getImm(), llvm::MCInst::getOpcode(), llvm::MCInst::getOperand(), llvm::MCOperand::getReg(), llvm::ARM_AM::getSOImmVal(), llvm::MCOperand::isExpr(), llvm::MCInstPrinter::markup(), printOperand(), and llvm::ARM_AM::rotr32(). Definition at line 826 of file ARMInstPrinter.cpp. References llvm::MCSubtargetInfo::getFeatureBits(), llvm::MCOperand::getImm(), llvm::MCInst::getOpcode(), llvm::MCInst::getOperand(), llvm_unreachable, llvm::ARMSysReg::lookupMClassSysRegAPSRNonDeprecated(), llvm::ARMSysReg::lookupMClassSysRegBy12bitSYSmValue(), llvm::ARMSysReg::lookupMClassSysRegBy8bitSYSmValue(), and llvm::BitmaskEnumDetail::Mask(). Definition at line 1287 of file ARMInstPrinter.cpp. References llvm::ARM_AM::decodeNEONModImm(), llvm::MCOperand::getImm(), llvm::MCInst::getOperand(), llvm::MCInstPrinter::markup(), and llvm::raw_ostream::write_hex(). Definition at line 951 of file ARMInstPrinter.cpp. Definition at line 310 of file ARMInstPrinter.cpp. References assert(), llvm::MCExpr::Binary, llvm::MCExpr::Constant, llvm::MCExpr::evaluateAsAbsolute(), llvm::MCInstPrinter::formatImm(), llvm::MCOperand::getExpr(), llvm::MCOperand::getImm(), llvm::MCInst::getOperand(), llvm::MCOperand::getReg(), llvm::MCOperand::isExpr(), llvm::MCOperand::isImm(), llvm::MCOperand::isReg(), llvm::MCInstPrinter::MAI, llvm::MCInstPrinter::markup(), printRegName(), Reg, and llvm::raw_ostream::write_hex(). Referenced by printAddrMode2Operand(), printAddrMode3Operand(), printAddrMode5FP16Operand(), printAddrMode5Operand(), printAddrModeImm12Operand(), printModImmOperand(), printT2AddrModeImm8s4Operand(), printThumbAddrModeImm5SOperand(), and printThumbAddrModeRROperand(). Definition at line 975 of file ARMInstPrinter.cpp. Definition at line 957 of file ARMInstPrinter.cpp. Definition at line 760 of file ARMInstPrinter.cpp. References assert(), llvm::MCOperand::getImm(), llvm::MCInst::getOperand(), and llvm::MCInstPrinter::markup(). Definition at line 750 of file ARMInstPrinter.cpp. Definition at line 578 of file ARMInstPrinter.cpp. Definition at line 597 of file ARMInstPrinter.cpp. Definition at line 587 of file ARMInstPrinter.cpp. References llvm::MCOperand::getImm(), llvm::MCInst::getOperand(), llvm::MCOperand::getReg(), and printRegName(). Definition at line 922 of file ARMInstPrinter.cpp. References llvm::ARMCC::AL, llvm::ARMCondCodeToString(), llvm::MCOperand::getImm(), and llvm::MCInst::getOperand(). Definition at line 771 of file ARMInstPrinter.cpp. References assert(), llvm::MCInst::begin(), llvm::MCInst::end(), llvm::MCRegisterInfo::getEncodingValue(), llvm::MCInst::getNumOperands(), llvm::MCInst::getOperand(), llvm::MCOperand::getReg(), llvm::MCInstPrinter::MRI, and printRegName(). Definition at line 87 of file ARMInstPrinter.cpp. Referenced by printAddrMode2OffsetOperand(), printAddrMode3OffsetOperand(), printAddrMode5FP16Operand(), printAddrMode5Operand(), printAddrMode6OffsetOperand(), printAddrMode6Operand(), printAddrMode7Operand(), printAddrModeImm12Operand(), printAddrModeTBB(), printAddrModeTBH(), printAM2PreOrOffsetIndexOp(), printAM3PreOrOffsetIndexOp(), printGPRPairOperand(), printInst(), printOperand(), printPostIdxRegOperand(), printRegisterList(), printSORegImmOperand(), printSORegRegOperand(), printT2AddrModeImm0_1020s4Operand(), printT2AddrModeImm8Operand(), printT2AddrModeImm8s4Operand(), printT2AddrModeSoRegOperand(), printT2SOOperand(), printThumbAddrModeImm5SOperand(), printThumbAddrModeRROperand(), printVectorListFour(), printVectorListFourAllLanes(), printVectorListFourSpaced(), printVectorListFourSpacedAllLanes(), printVectorListOne(), printVectorListOneAllLanes(), printVectorListThree(), printVectorListThreeAllLanes(), printVectorListThreeSpaced(), printVectorListThreeSpacedAllLanes(), printVectorListTwo(), printVectorListTwoAllLanes(), printVectorListTwoSpaced(), and printVectorListTwoSpacedAllLanes(). Definition at line 1305 of file ARMInstPrinter.cpp. Definition at line 941 of file ARMInstPrinter.cpp. References assert(), llvm::MCInst::getOperand(), and llvm::MCOperand::getReg(). Definition at line 798 of file ARMInstPrinter.cpp. Definition at line 736 of file ARMInstPrinter.cpp. Definition at line 400 of file ARMInstPrinter.cpp. References llvm::MCOperand::getImm(), llvm::MCInst::getOperand(), llvm::MCOperand::getReg(), llvm::ARM_AM::getSORegOffset(), llvm::ARM_AM::getSORegShOp(), printRegImmShift(), printRegName(), and llvm::MCInstPrinter::UseMarkup. Definition at line 380 of file ARMInstPrinter.cpp. References assert(), llvm::MCOperand::getImm(), llvm::MCInst::getOperand(), llvm::MCOperand::getReg(), llvm::ARM_AM::getShiftOpcStr(), llvm::ARM_AM::getSORegOffset(), llvm::ARM_AM::getSORegShOp(), printRegName(), and llvm::ARM_AM::rrx. Definition at line 1208 of file ARMInstPrinter.cpp. References llvm::MCInstPrinter::formatImm(), llvm::MCOperand::getImm(), llvm::MCInst::getOperand(), llvm::MCOperand::getReg(), llvm::MCInstPrinter::markup(), and printRegName(). Definition at line 1223 of file ARMInstPrinter.cpp. Definition at line 1153 of file ARMInstPrinter.cpp. Definition at line 1238 of file ARMInstPrinter.cpp. Definition at line 1177 of file ARMInstPrinter.cpp. References assert(), llvm::MCOperand::getImm(), llvm::MCInst::getOperand(), llvm::MCOperand::getReg(), llvm::MCOperand::isReg(), llvm::MCInstPrinter::markup(), printOperand(), and printRegName(). Definition at line 1256 of file ARMInstPrinter.cpp. References assert(), llvm::MCOperand::getImm(), llvm::MCInst::getOperand(), llvm::MCOperand::getReg(), llvm::MCInstPrinter::markup(), and printRegName(). Definition at line 1109 of file ARMInstPrinter.cpp. References assert(), llvm::MCOperand::getImm(), llvm::MCInst::getOperand(), llvm::MCOperand::getReg(), llvm::ARM_AM::getSORegOffset(), llvm::ARM_AM::getSORegShOp(), llvm::MCOperand::isImm(), printRegImmShift(), printRegName(), Reg, and llvm::MCInstPrinter::UseMarkup. Definition at line 1078 of file ARMInstPrinter.cpp. Definition at line 1085 of file ARMInstPrinter.cpp. Definition at line 1092 of file ARMInstPrinter.cpp. Definition at line 1056 of file ARMInstPrinter.cpp. Referenced by printThumbAddrModeImm5S1Operand(), printThumbAddrModeImm5S2Operand(), printThumbAddrModeImm5S4Operand(), and printThumbAddrModeSPOperand(). Definition at line 1036 of file ARMInstPrinter.cpp. References llvm::MCInst::getOperand(), llvm::MCOperand::getReg(), llvm::MCOperand::isReg(), llvm::MCInstPrinter::markup(), printOperand(), and printRegName(). Definition at line 1099 of file ARMInstPrinter.cpp. Definition at line 1018 of file ARMInstPrinter.cpp. References assert(), llvm::countTrailingZeros(), llvm::MCOperand::getImm(), llvm::MCInst::getOperand(), and llvm::BitmaskEnumDetail::Mask(). Definition at line 350 of file ARMInstPrinter.cpp. References llvm::MCInstPrinter::formatImm(), llvm::MCOperand::getExpr(), llvm::MCOperand::getImm(), llvm::MCInst::getOperand(), llvm::MCOperand::isExpr(), llvm::MCInstPrinter::MAI, llvm::MCInstPrinter::markup(), and llvm::MCExpr::print(). Definition at line 1003 of file ARMInstPrinter.cpp. Definition at line 1010 of file ARMInstPrinter.cpp. Definition at line 729 of file ARMInstPrinter.cpp. References llvm::MCOperand::getImm(), llvm::MCInst::getOperand(), and llvm::ARM_TSB::TraceSyncBOptToString(). Definition at line 1368 of file ARMInstPrinter.cpp. Definition at line 1423 of file ARMInstPrinter.cpp. Definition at line 1479 of file ARMInstPrinter.cpp. Definition at line 1558 of file ARMInstPrinter.cpp. Definition at line 1525 of file ARMInstPrinter.cpp. Definition at line 1374 of file ARMInstPrinter.cpp. Definition at line 1440 of file ARMInstPrinter.cpp. Definition at line 1408 of file ARMInstPrinter.cpp. Definition at line 1463 of file ARMInstPrinter.cpp. Definition at line 1542 of file ARMInstPrinter.cpp. Definition at line 1510 of file ARMInstPrinter.cpp. Definition at line 1382 of file ARMInstPrinter.cpp. Definition at line 1449 of file ARMInstPrinter.cpp. Definition at line 1395 of file ARMInstPrinter.cpp. Definition at line 1497 of file ARMInstPrinter.cpp.